There is a certain aesthetic, a certain artistic philosophy that I have always been drawn to. From when I was quite young, I was always enrapt with the hippie kids of the late 60s and early 70s. The clothes: the sinuous curves of skirts and bell sleeves and bell bottoms, the drape of fringe, of shawls, the long, long hair, as well as the music, the ideologies. I adored those iconoclasts who broke away more definitively from their parents’ generation than any before them in American history. Later on in life, I discovered the Aesthetic Movement that occurred in the latter half of the 19th century: Oscar Wilde and his dandyism, the dreamy, wanton art created by the Pre-Raphaelite Brotherhood, as well as the gracefully naturalistic curves of the Art Nouveau movement that came a few years later. The Aesthetes had a resurgence in the mid-to-late seventies in the form of glam rock, with Marc Bolan of T. Rex and David Bowie as poster children: all flounce and pomp and smolder with a sprinkle of glitter. There’s a common thread of decadence through all of it, a pervasive “bohemianism” that encapsulates all of those movements that I find myself enthralled with. There’s an idealistic focus on nature, on free-thinking, on artistic expression that involves all of the senses. My life-long love affair with these aesthetics have led me to this color palette, the one pictured above. It’s kind of my default color palette, really. If I have five minutes to pick out a few colors, I’ll grab these. If I have an hour, I will pick out a color that is drastically outside of my norm, and then proceed to pick out other colors until it all comes back around to, you guessed it, my default colors! I can’t help it. I just love them! 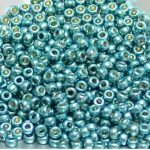 The main colors, for me, are the turquoises, the green and the blue. It’s accented by whiskey brown, warm marigold, sequoia brown, vivid purple, California pink, and a few touches of metal: a bit of tarnished gold, maybe some brass and copper. Texture-wise, it’s silks and time-worn leather and velvet. It’s all about sensuality (read: involving all the senses) and rich earthiness. This is my version of an earthy palette. I’ve decided to call it Earth According to the Rainbow. The resulting creation was this necklace. It has brilliantly colored leather, chips of turquoise, accents of white-heart African trade beads, a few leather-polished jade beads, an origami-folded star made of copper sheet (that I made myself! 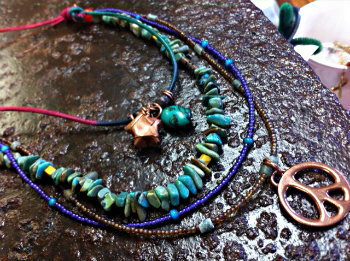 ), some antique brass beads, glass seed beads, and the iconic peace sign. It’s eclectic and colorful and has a lot of texture. The layers and the drape of it are in line with the styles I talked about above. It has the feel of a layered piece in a single necklace. It could easily have a few more strands, some chain, another strand or two of seed beads or gemstones. Maybe a little sari silk with a few charms hanging off it. 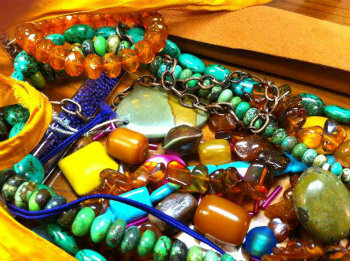 A matching, multi-strand or wrap bracelet would be so easy to create. Sometimes it’s fun to let your inner aesthete come out to play!